Property Size 800 sq. 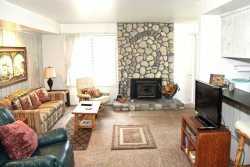 ft.
Nice One Bedroom & One Bath Condominium located in the Scenic Meadow Area of Mammoth Lakes. Sleeps up to 5 (approx. 800 Sq. Ft.). This spacious ground floor unit is all one level and there are no outside stairs to enter the unit. Corner unit is bright with lots of windows to let the light in and has a partial view. The Master Bedroom has 1 King Bed and a Twin Roll-a-way Bed and the Living Room has a Queen Foldout Couch. There are 2 TVs Living Room (Flat Screen) & Bedroom as well as a DVD player. Phone in unit 760 934-6902 and WIFI Internet access. Whitewashed woodwork and mountain cabin style furnishings await you in this cozy unit. There is one outside parking space available. Sunrise Condominiums offer a Spa, Seasonal Swimming Pool and Sauna. Coin-operated laundry facilities located in the common area near the office. COMPLIMENTARY INTERNET and CABLE TV are provided, however NO REFUNDS will be given for connectivity problems or Internet failure. This unit is No Pets and No Smoking but the owners do bring their own pet when they stay. TOT LICENSE 807-SR12. Great place, super clean and functional. Nice location within the complex just across from the pool/jacuzzi. Would stay again! The apartment was great and in a nice location, close to town and easily accessible to the Mammoth shuttle. It is a nice well equipped condo. Feels just like home. Jacuzzi and sauna are a great treat after a long day on the slopes. Close enough to stores and resort . Thank you, I just went to have fun and I did! This place feels like home, the second you take that first step in! Warm, cozy, and full of character. My girlfriend and I, used this place for a weekend get away and were very happy with this place. We took advantage of the fully stocked kitchen; making breakfast and dinner. The heaters kept the entire home toasty. The fireplace was also great to be around. Due to weather, it was a little harder to find our unit and parking. I will say it was close to the office, pool, hot tub, laundry, and parking. We were also just around the corner from the bus stop, which took us to the village and also brought us back. It was nice real estate and actually has some nice views. Unfortunately, we were never able to use the patio/balcony. Snow coverage made it impossible. Would have been nice if that was shoveled before our arrival. Overall, we cannot wait to stay here again! It was just a perfect trip and this place was very hard to leave behind. We will be booking with them soon! This is a fantastic and spacious spot for a ski trip. One block from the bus stop that takes you to the mountain. We very comfortably slept 4 and took full advantage of the well equipped kitchen. We were surprised by how lovely and well priced this was and will definitely be back for more snow! This was a great little condo located close to the Village and the Slopes and had everything we needed for a comfortable visit. Great place to stay and not too far from the slopes. Easy to check-in and check-out. Easy parking and easy to throw away the trash when check in-out. We enjoyed our stay. We liked that it was near the central business shops and restaurants. The fall colors were beautiful. We loved the serenity of the complex. The pool was perfect for the youngest in our group and the gas barbecue was a really nice amenity. We also really liked the location - easy walk to town and also easy to get to the village and lakes without having to go through town each time. Unit 12 was absolutely perfect. We had a lovely trip. Loved the complex though and would definitely return there. Turn Right on Minaret Rd. Turn Right again on Meadow Lane. Sunrise is on the left hand side half way down the street.